January 17, 2002 – Mount Nyiragongo erupts in the Democratic Republic of the Congo, displacing an estimated 400,000 people. 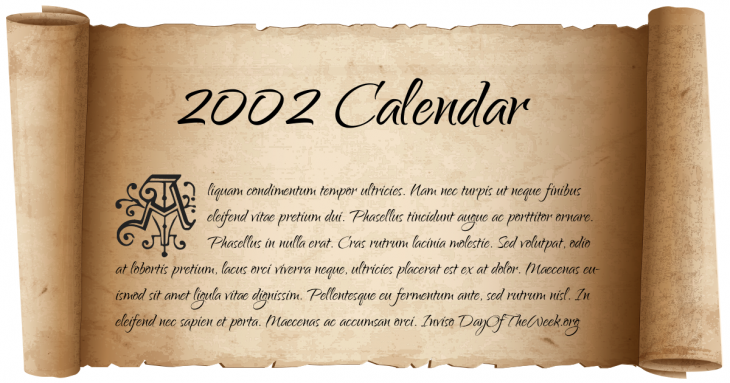 February 12, 2002 – New Year’s Day in Chinese calendar. Start of the year of the Water Horse in Chinese astrology. February 27, 2002 – Ryanair Flight 296 catches fire at London Stansted Airport. Subsequent investigations criticize Ryanair’s handling of the evacuation. March 3, 2002 – Citizens of Switzerland narrowly vote in favor of their country becoming a member of the United Nations. March 18, 2002 – U.S. invasion of Afghanistan: Operation Anaconda ends (started on March 2) after killing 500 Taliban and al Qaeda fighters with 11 allied troop fatalities. June 11, 2002 – Antonio Meucci is acknowledged as the first inventor of the telephone by the United States Congress. June 24, 2002 – The Igandu train disaster in Tanzania kills 281, the worst train accident in African history. September 10, 2002 – Switzerland, traditionally a neutral country, joins the United Nations. November 13, 2002 – The oil tanker Prestige sinks off the Galician coast and causes a huge oil spill. November 21, 2002 – NATO invites Bulgaria, Estonia, Latvia, Lithuania, Romania, Slovakia and Slovenia to become members. Who Were Born On 2002?